Mario and Luigi in the sewers. The Beanbean Castle Sewers are the waterworks found in the underground of Beanbean Castle. 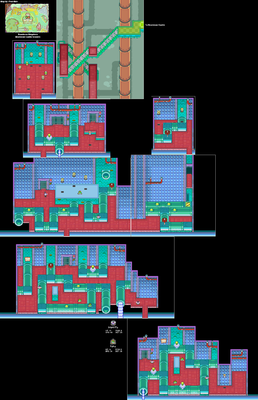 They run the water supply of the castle and Beanbean Castle Town during Mario & Luigi: Superstar Saga. Lady Lima and several other of the castle's inhabitants were locked in the sewers by Cackletta. When Mario and Luigi arrived at the castle, Cackletta, disguised as Lady Lima, pretended to not trust them so that they could go into the sewers and fix the plumbing, so as to prove that they are truly who they say they are. However, fixing the sewer's pipes caused the Beanstar's protection to be disabled, allowing it to be stolen. Mushroom In the third screen, in the left ? Block above the north platform. In the third screen, in the right ? Block above the north platform. In the second area to the right of the third screen, in the ? Block in the left. In the second area to the right of the third screen, in the ? Block in the right. In the room where Lady Lima is trapped, in the ? Block in the left. In the room where Lady Lima is trapped, in the left ? Block in the south. In the room where Lady Lima is trapped, in the right ? Block in the south. Syrup In the third screen, in the center ? Block above the north platform. In the room where Lady Lima is trapped, in the right ? Block in the north. This page was last edited on February 18, 2019, at 20:31.